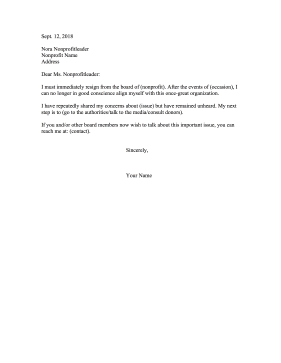 This nonprofit resignation letter is intended for members who no longer wish to sit on the board of directors. I must immediately resign from the board of (nonprofit). After the events of (occasion), I can no longer in good conscience align myself with this once-great organization. I have repeatedly shared my concerns about (issue) but have remained unheard. My next step is to (go to the authorities/talk to the media/consult donors). If you and/or other board members now wish to talk about this important issue, you can reach me at: (contact).